11:30 - "The Sourlands: A New Jersey Treasure." , 1 p.m.: Sunday Shorts, "That Beetle Down There," "The Elephant's Song," and "Things Were Better Before." 2 p.m.: "Inventing Tomorrow." 4:30 p.m.: "The River and the Wall." For additional information and to purchase tickets, click here or call 609-989-9417 extension 133. Back for a second year, Building Princeton (using 70,000 LEGO building blocks) is designed to increase awareness of the town’s rich architectural heritage. This family program, with adults and children working together, is ideal for 3rd-6th graders, but all ages are encouraged to participate. Teams each receive a photograph and story of a historic building, which they build within the 2-hour program. When the models are finished, they are placed on a 30-foot map of Princeton, providing an amazing aerial view of the town. At the conclusion of the program each family will receive a copy of “The Princeton Architectural Treasure Hunt Map” and are encouraged to go out as a family and find the real buildings. Please arrive at 1:30 PM to select your building. Family English Country Dancing with live music. Beginners welcome. $7-$20. On Sunday, April 14, 2019, Friends of Princeton Open Space (FOPOS), a nonprofit devoted to preservation and stewardship of land in Princeton, will host their annual meeting featuring speakers, Alicia Forero and Lexus Woznicki of TerraCycle. They will speak about the LOOP system presented at the Davos Economic Conference, which substitutes durable, reusable or completely recyclable product packaging for our current wasteful and increasingly unworkable system. Attendance is free, however, a limited amount of seats are available. Pre-registration via Eventbrite.com is required. The deadline to reserve tickets is April 11, 2019. Refreshments will be served. Event location is Mountain Lakes House, 57 Mountain Ave, Princeton, New Jersey, from 3-5PM. 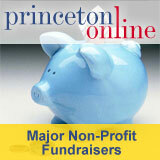 For information about Friends of Princeton Open Space, please visit fopos.org. For questions, please email info@fopos.org. Pianist Phil Orr performs. Donations benefit the Out of the Darkness Walk for Suicide Prevention. All singers welcome. No auditions. Vocal scores provided. Refreshments at intermission. $10 admission for singers (or annual membership). Free for students and non-singing guests. Westminster Chapel Choir Presents "Tapestry"
Westminster Chapel Choir, guest-conducted by Tom Shelton, presents a concert titled "Tapestry" on Sunday, April 14 at 7:30 p.m. in Bristol Chapel on the campus of Westminster Choir College of Rider University in Princeton, N.J. The ensemble will be joined by guest artist, Ken Cowan, organ. Tickets are $20 for adults and $15 for students and seniors and are available by phone at 609-921-2663 or online at www.rider.edu/arts.